Each site has two links to their HQ (top) via WAN (Prio) and Internet ( backup ). 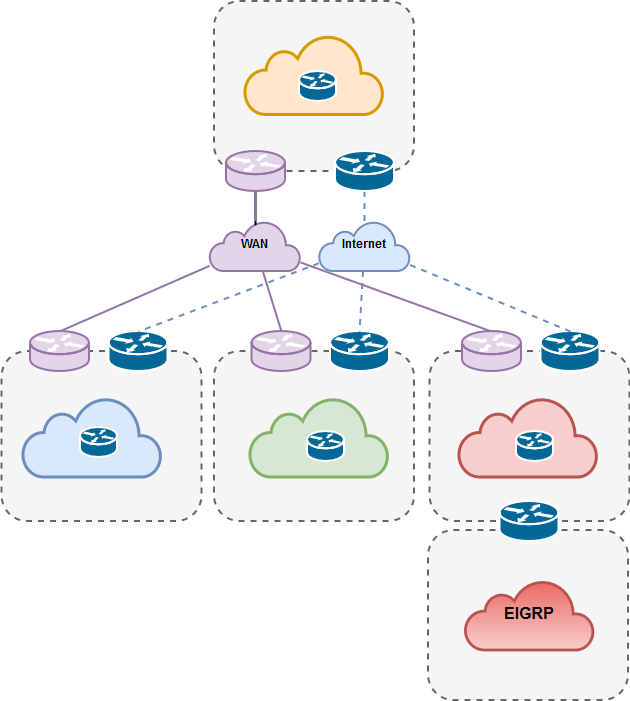 Internet and WAN connectivity goes over multipoint GRE tunnels to the sites with static NHRP mappings. Cost of Internet links are increased so they’re used as backup links. R1 functions as the internet. 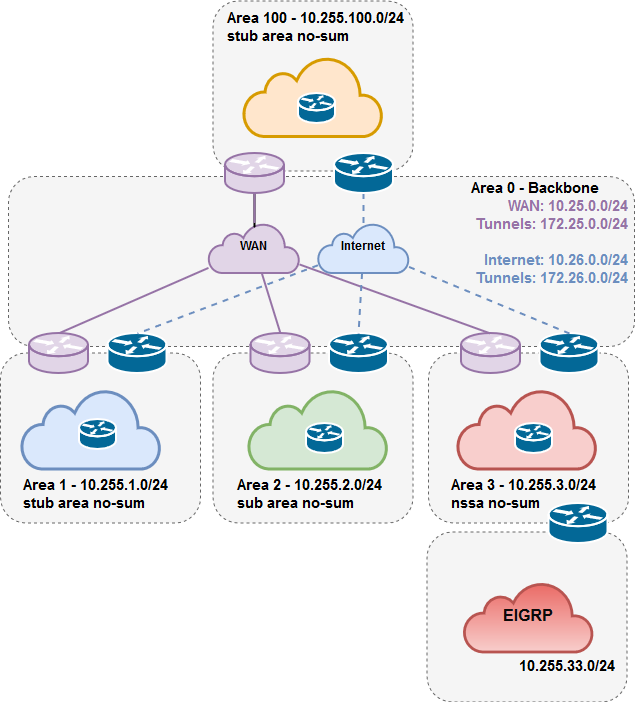 There must be a GRE tunnel configured between R2 and R3 so that OSPF can be used between them. In the example we will use a tunnel with and without IPsec. For the totally stub areas the ABR filters the Type 3 LSAs. Filtering prevents the creation of LSAs. With multiple ABRs filtering should be done on both. 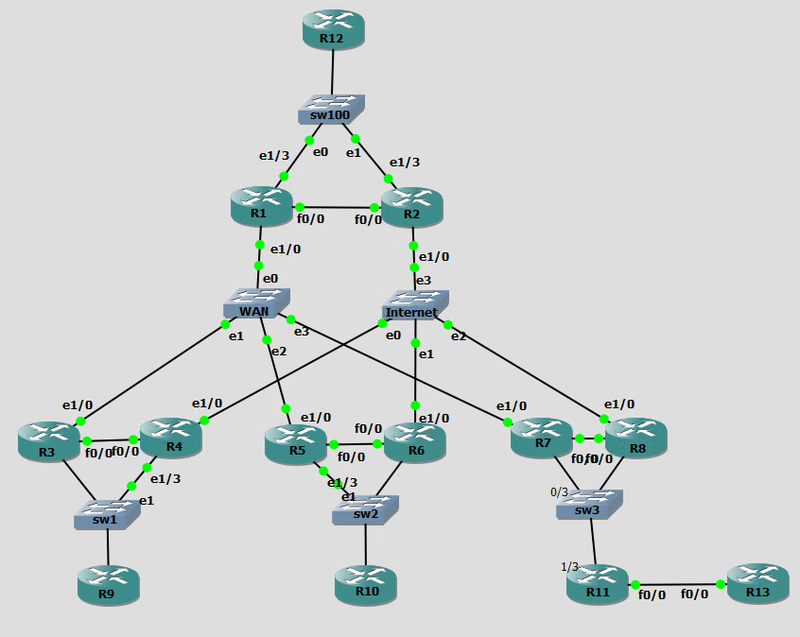 Analyse the LSDB to find all possible routes to reach the subnet. Per route, add the interface cost for all outgoing interfaces in that route. Pick the route with the lowest cost. Cost is derived from the egress interface bandwith. Each router stores it’s LSA in it’s LSDB. Each router within the same area should have the same LSDB information. SPF algortithm for each area it is connected to. LSAs in OSPF LSDB are pieces that the SPF process uses. OSPF poisons LSA by setting max-age (3600).